Schnucks is a supermarket chain. Established in the St. Louis area, the company was started in 1939 with the opening of a 1,000-square-foot (93 m2) store in north St. Louis and now operates 119 stores  in five states throughout the Midwest. Schnucks also ran stores under the Logli Supermarkets and Hilander Foods banners. Schnucks is one of the largest privately held supermarket chains in the United States and dominates the St. Louis metro grocery market. Schnuck Markets, Inc. was founded in St. Louis in 1943. In 1943, its first large-scale retail store was opened, measuring 2,700 square feet (250 m2). By 1952, its first major store was opened in Brentwood, a St. Louis suburb. The Schnucks symbol, a soldier, was introduced in 1968 (during the Vietnam War). Schnucks continued to grow, adopting the motto "Friendliest Stores In Town" and acquiring stores in Illinois, Indiana, Tennessee, Mississippi, Missouri, Iowa, and Wisconsin. A previous merger in 1970 had seen Schnucks acquire the Bettendorf-Rapp chain of grocery stores—temporarily forming the Schnucks-Bettendorf's chain (a joke was that an initially proposed name for the merged company was "Schnuckendorfs") until the latter half of the combined name was dropped a couple of years later—just as Bettendorf's had swallowed up the Rapp chain of stores to form Bettendorf-Rapp's in the 1960s. Schnucks underwent a major expansion in 1995 when it purchased from Loblaws the National Supermarkets chain, also based in St. Louis. Schnucks' growth in the St. Louis area was bolstered by the local abandonment of two major supermarket chains: A&P in the 1970s, and Kroger in 1986. In 2002, Schnucks agreed to buy 12 Seessel's stores in the Memphis, Tennessee area, from Albertsons, Inc. Schnucks operated these stores until September 2011. Kroger subsequently purchased these stores; eight reopened as Kroger, with the others closing altogether. Seven convenience stores operating under the Schnucks name also were sold, to be converted to the Kroger-owned brand Kwik Shop. 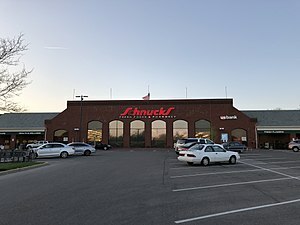 In 2008 Schnucks acquired grocery store Hart Food and Drug in O'Fallon, IL making it the fifth Schnucks in St. Clair County. In September 2011, Schnucks purchased seven former Hilander stores in the Rockford, Illinois area from The Kroger Co. In May 2014, Schnucks closed three of the seven former Hilander stores. One property was sold, and the other two are vacant and for sale. Due to the highly competitive market, Schnucks had a non-compete clause which meant that a grocery store could not move into these vacant locations, but the city has since passed an ordinance to block such restrictions. In September of 2018 Schnucks announced the purchase of 19 Shop 'n Save locations (14 in Missouri and 5 in Illinois; all in the St. Louis metropolitan area) from SuperValu, along with one standalone pharmacy in Union, Missouri and the prescription files from 10 additional Shop 'n Save stores not included in the sale. This announcement came shortly after Schnucks purchased a former Shop 'n Save in Maplewood, Missouri in August 2018. Beginning in December 2012, Schnucks experienced a system compromise. During a four-month period, up to 2.4 million credit/debit cards were put at risk. Many people had to cancel credit and debit cards. As of March 2013, Schnucks reported that the system compromise had been resolved. In February 2017, Schnucks launched a home delivery service in partnership with Instacart called Schnucks Delivers to the Metro St Louis area. The initial response and order quantities broke numerous Instacart records. Schnucks Delivers subsequently launched in the Rockford and Evansville Markets in April 2017. The Schnucks Delivers service is now available company-wide, including the Peoria/Champaign/Bloomington markets, as well as the Janesville, Wisconsin and Bettendorf, Iowa locations. The company is family owned, with the fourth generation now working for the company. In 2007, Schnucks decided to better compete with Walmart, beginning a campaign called "Recipe for Success". Schnucks also began a program where it lowered prices on 10,000 items to be more competitive with Walmart. Schnucks leadership led the plan, which included making their employees knowledgeable on the food they sold. The first Schnucks Pharmacy was opened in March 1970. As of 2012, there are 95 in-store pharmacies across Missouri, Illinois, Indiana, Wisconsin and Iowa. The quality of the healthcare provided by Schnucks Pharmacy was recognized when it was named "Pharmacy Chain of the Year 2008" by Drug Topics Newsmagazine. Schnucks offers over 50 generic prescriptions that can be filled for $4 for a 30-day supply, or $10 for a 90-day supply. The pharmacy also fills prescriptions for seven different generic antibiotics for free, with up to a 21-day supply. This program for free antibiotics was recently changed to include one liquid antibiotic. Recently, Schnucks Pharmacy launched a program offering certain prenatal vitamins at no cost for a month's supply. As of January 1, 2017, the pre-natal vitamins are offered for $4. In addition to low-cost prescriptions, Schnucks Pharmacy also offers a crutch loan program where customers can pick up a pair of crutches for a small deposit that is refunded when they are returned. Schnucks Pharmacy has removed the crutch program and no longer offers rentals. The Schnucks Deli has a variety of freshly prepared food items and sandwiches. The sandwiches include the Bagel Sandwich Combo, Gourmet Poor Boy, Poor Boy, and the King of the Hill. The Gourmet Poor Boy is different from the Poor Boy in the meat selection. The Poor Boy has salami and bologna along with Swiss cheese. The Gourmet Poor Boy has ham and roast beef along with Swiss cheese. Schnucks has supported charitable causes, including the United Way, The Salvation Army Tree of Lights, Susan G. Komen for the Cure, St. Louis Variety - The Children's Charity, and Operation Food Search. ^ "Schnucks announces the addition of stores in the Metro East". Schnuck Markets, Inc. (press release). October 13, 2008. Retrieved September 4, 2011. ^ Miles, Jason (August 31, 2011). "Kroger to acquire Memphis area Schnucks". Memphis, Tennessee: WMC-TV Action News 5. Retrieved September 4, 2011. ^ "Kroger's Convenience Store Division to Purchase Memphis Stores From Schnucks; Will Operate as Kwik Shop". The Kroger Co. September 2, 2011. Retrieved September 4, 2011. ^ "Culinaria, A Schnucks Market, a New Sign of Progress in Downtown St. Louis". Schnuck Markets, Inc. (press release). June 3, 2009. Retrieved September 4, 2011. ^ "Announcement - Schnucks". Schnucks. Retrieved 2018-09-18. ^ "Schnuck Markets, Inc". nourish.schnucks.com. Retrieved 2018-09-18. ^ a b "More About Schnucks Pharmacy". Schnucks.com. Retrieved 2011-09-04. ^ Levy, Sandra (April 14, 2008). "Schnucks Pharmacy: Drug Topics' Chain of the Year 2008". Drug Topics. Retrieved September 4, 2011. ^ "Save on Generic Drugs". Schnucks.com (web site). 2008-06-27. Retrieved September 4, 2011. Now, we offer more than 300 Generic Prescriptions for just $4! ^ "Free Prescription Drug Program - For Generic Oral Antibiotics*! from Schnucks Pharmacy". Schnucks.com (web site). Retrieved September 4, 2011. ^ "Free Prescription Prenatal Vitamins". Schnucks.com (web site). Retrieved September 4, 2011. This page was last edited on 11 March 2019, at 19:13 (UTC).